Having a beautiful online store with Shopify is an awesome way to sell products to customers by itself. But the icing on the cake is that Shopify allows you to sell your products directly on Facebook, Twitter, and Pinterest. With this is mind, I want to share with you why minding social media image constraints, including Facebook image sizes, is so important. Each platform has different specific image restrictions. This means each platform will show a different but specific portion of your image. 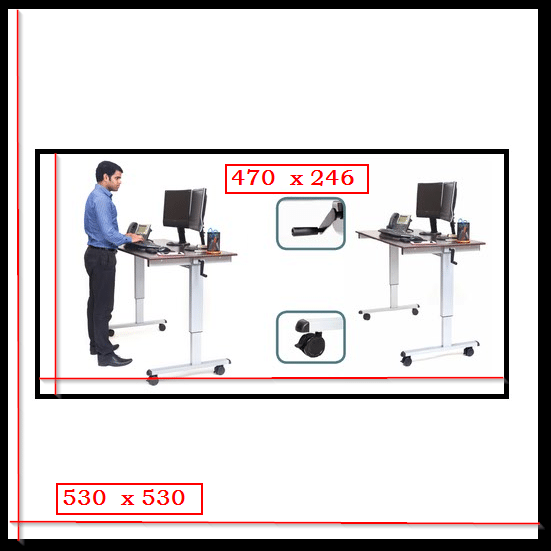 Some platforms have multiple display restrictions depending on where the image is seen or what device the image is seen on. These platforms automatically select the primary image listed in your Shopify product page. 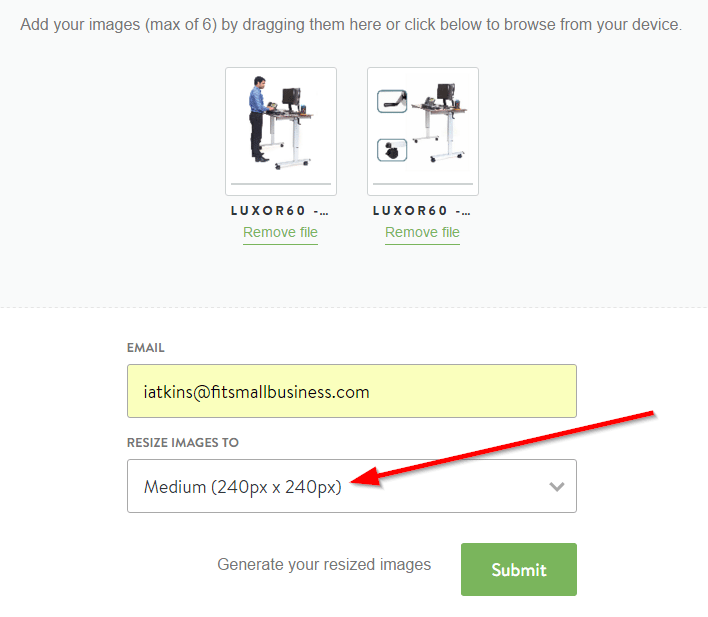 This means you need that single image in Shopify to fit multiple display restrictions. Since social media is all about images, your success selling on these platforms will depend on addressing these issues. I’m going to show you how to address these issues and how to make Shopify product images look great on Facebook. Plus, I will show you how to do this without making any unwanted changes to your Shopify online store. It’s not as hard as it sounds and the same process can be applied to Twitter and Pinterest. Ready to get started? If you haven’t already, click here to sign up for a free Shopify trial and start selling on Facebook today. Shopify gives you a lot of flexibility when it comes to how your images are displayed on your online store. Facebook does not. Facebook image sizes are strict and you must pay attention to them if you’re selling on Facebook. 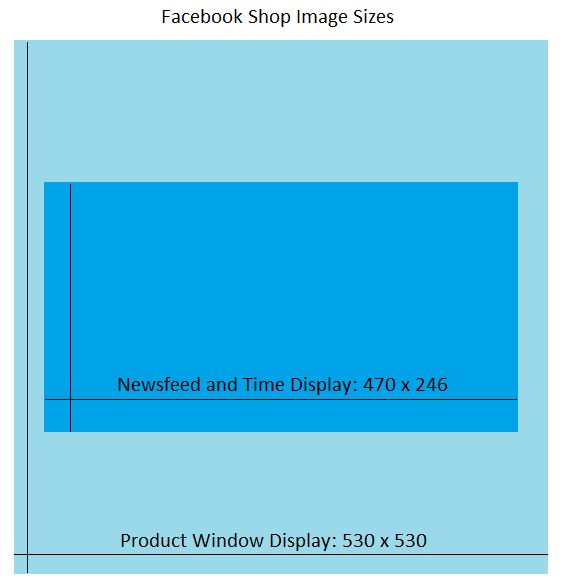 Facebook’s Shop and Product Display Window will display images as a 530 x 530 square. If the image used is a larger square, Facebook will shrink to fit. If the image used is a smaller square, it will appear blurry. If the image used is not a square, Facebook will auto-crop it and you will lose parts of the image. Facebook’s Timeline and News Fees will display the a horizontal rectangle taken from the center of your product’s primary product image. It will only display the 470 x 246 center of the image. So for your primary image to look great across all of Facebook, you need it to be an image that is 530 x 530 but which has a center 470 x 246 that accurately and compellingly represents your product. Resizing your Shopify product images to fit a new display iis easy if the new display has the same dimensions ratio. In fact, there are many websites that will instantly resize your images for free. Shopify has one that works well, as does LunaPic. However, if the display ratio is different than your image ratio, you might find that resizing images distorts the image so much that is becomes unusable. I had this problem with a number of tall images that I needed to fit into Facebook’s square and wide horizontal displays. In these cases, I simply opened up MS Paint, pasted in a selected image, then after checking the images dimension, fit the background to be a square. Once saved, I have a perfectly square image that would work well on Facebook Shop’s product display window. In order to get my images sized correctly for the news feed I did something similar in Paint. First, I opened Paint and set the background to 530 x 530. Then, I centered a boxed sized at 470 x 246. I then used Shopify’s free image resizer to resize two larger square product images that I could fit inside the 470 x 246 box. 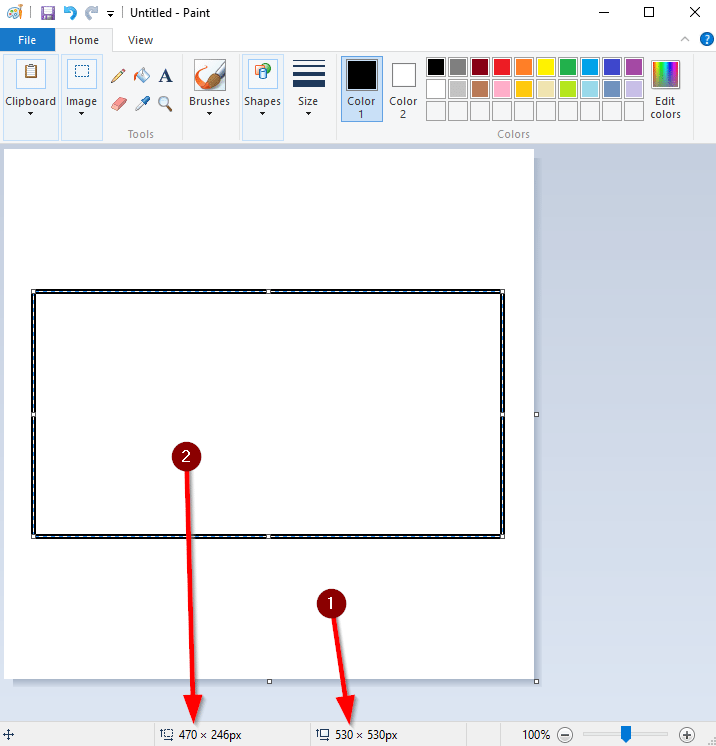 I then add those two smaller images to my Paint window with the 470 x 246 outline. What I am left with is a image that will display well on Facebook’s news feed or timeline. Note: While I am using two resized product images in this example, you could simply add a cropped selection of one photo, etc. You’re now ready to set this image as your product’s primary image as it has been fully optimized for Facebook. It will fit the Facebook Shop’s product window display of 530 x 530 and Facebook’s news feed and timeline display of 470 x 246. However, you probably don’t want this image to be your primary image for any sales channel other than Facebook. That means you’ll want to create a product listing specifically for Facebook. Creating a duplicate product listing that is optimized for a specific sales channel, like Facebook, is easy with Shopify. Simply go to your product page in Shopify. From there, select “Duplicate” in the upper right hand corner. 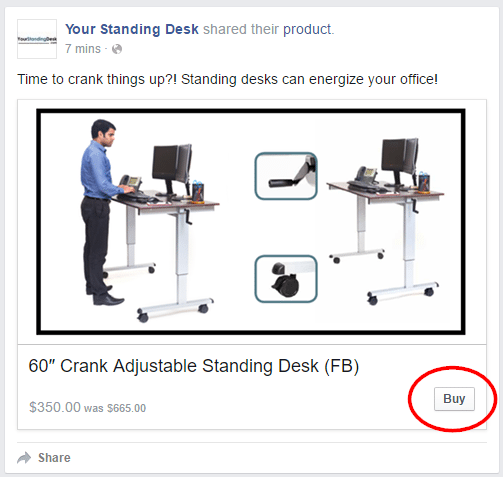 Change the Product Title to something that will allow you to recognize it as Facebook product listing. For example, I added “(FB)” to the end of my title. Then swap in your Facebook optimized images. 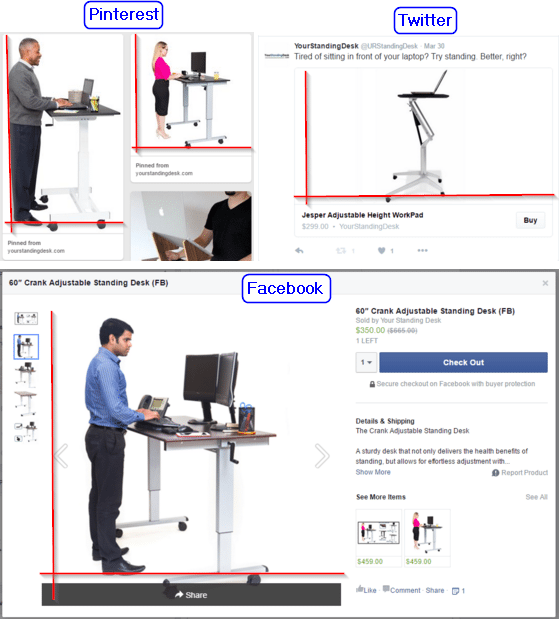 Remember, your primary image should be optimized for both the 530 x 530 Facebook Shop product window display and the 470 x 246 Facebook news feed and timeline. The product listing you just duplicated in Shopify is optimized for Facebook which mean you don’t want it popping up on your online store or blog or in a Tweet. Shopify makes restricting this duplicated product to Facebook only very easy. On the right side of the page under the heading “Visibility” select Facebook only. 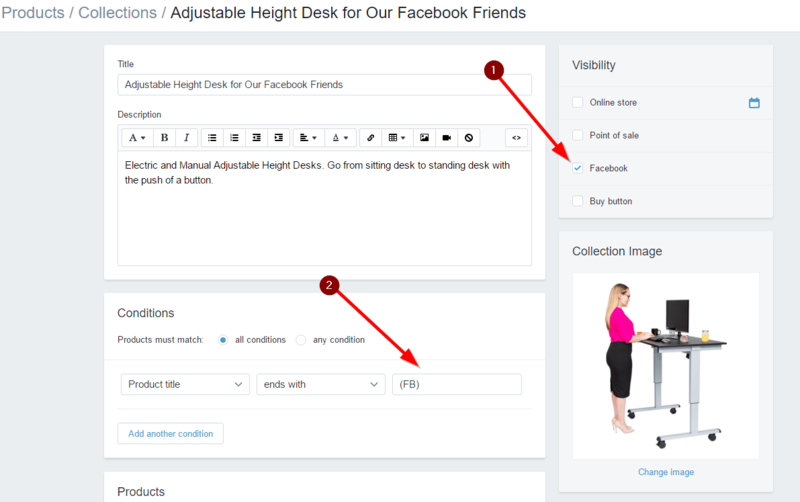 By creating a Shopify Collection that is specific for Facebook you can not only add individual products to Facebook, but you can group them any way you choose to. Having all of the products that will be listed in your Facebook Shop also allows you to make changes or updates to those products without hunting through all of your Shopify product listings. You now have product images that can be displayed perfectly on Facebook Shop and Facebook timelines and news feed. 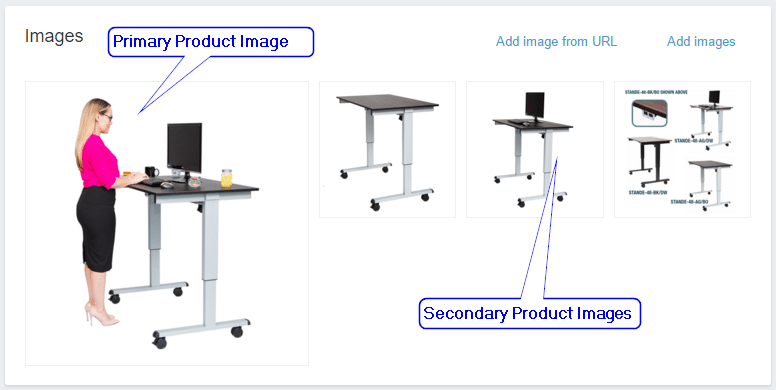 Not only that, those images are attached to duplicated product listing that are only visible on the platform they will look best. Plus, their grouped into collections which are also only visible on the platform they’ve been optimized for. The same same process can be used for any other sales channel. 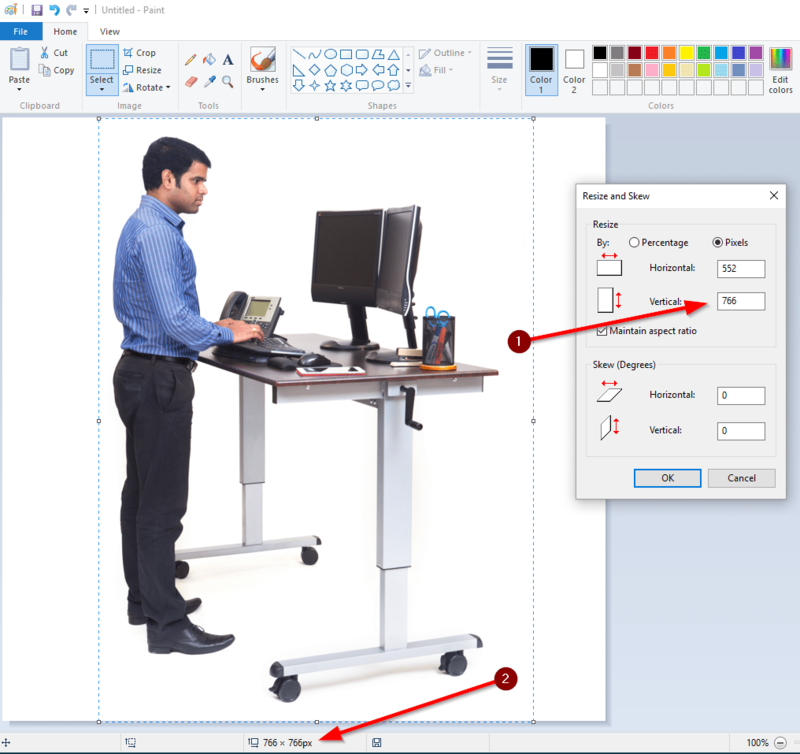 The starting place is always learning how your product images will be displayed. Once you have the process down, a quick search will show you image sizes for Twitter ads or image sizes for Pinterest as well. Thanks for giving this information……….. I am new to all picture taking. My husband collects Dallas Cowboys memorabilia that is displayed as a museum in our home. As a budgeting issue, I have volunteered to do the photos for a book bring written about this. I’m haven’t gotten an answer yet on if it is going to be a book or an ebook. I am already very busy and waisting time is not an option. What do you suggest? I was a looking for a solution that would take into account that some shops have stock numbers kept through shopify. Unfortunately duplicating the product requires more admin work and no doubt will create human error some where in time. We’re in agreement on the additional admin work and possibility for human error. It would be great if there were an easy way for these to sync up. If you find a better way to do this let us know. We’ll do the same.